The Tribute to Exemplary Entrepreneurs is an initiative promoted by E2IN2, with the aim of shedding light on the role of the entrepreneur as a generator of wealth. 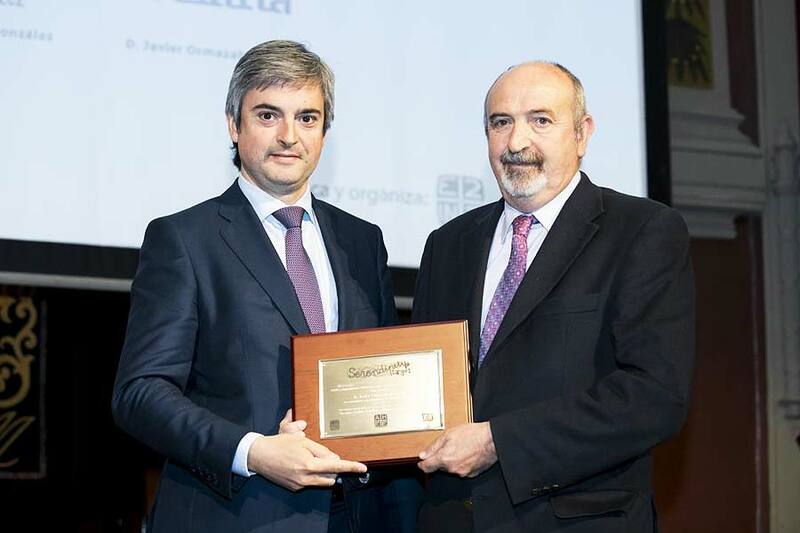 The founder of Velatia, Javier Ormazabal Ocerin, was honoured the past week for his entrepreneurial work in the Tribute to Exemplary Entrepreneurs 2018, which was held at Ateneo in Madrid, in its second edition. This award, promoted by E2IN2, aims to vindicate the role played by entrepreneurs in society as generators of wealth and drivers of progress. The event, which in turn acknowledged the members of the Ormazabal family, including Alejandro Ormazabal Echevarria, the son of the late founder and Vice President of Velatia, highlighted the entrepreneurial work of the founder, who leaves the legacy of a business group with a turnover of 573 million Euros, 3,000 employees and an outstanding international presence in more than 50 countries. Thus, the Vice President of Velatia, who accepted the award on behalf of the Ormazabal family, appraised his father’s entrepreneurial character, whom he defined as “a businessman with vision, a born business leader”, but “first and foremost the leader of our family”. As reported by the organization, in addition to recognizing the work of entrepreneurs, the tribute aims to act as an inspiration for current and future entrepreneurs seeking benchmarks for the dedication required to create a family business and keep it alive over several generations. Other well-known entrepreneurs from companies such as Freixenet, Grupo Consorcio, Joselito, Lhardy or Litografía González also received awards during the event. On the other hand, in an effort to give continuity to the tribute, all the “exemplary entrepreneurs” will be present in a 3D virtual park where you can walk around, discover and get more information about the figures of those honoured.